Yesterday, I shared all about how I’ve managed to stretch our grocery shopping to every 2-3 weeks — which (in my opinion) is a huge accomplishment considering our family of 6 eats a HUMONGOUS amount of fresh fruits, veggies, greens, dairy, eggs, etc. It has taken me many months to get my system down to a “science” but I am to the point now where I waste almost nothing due to planning ahead and making sure to properly store, regularly prep, and diligently serve fresh produce for every meal. Here’s a more detailed look into how I do this each week. 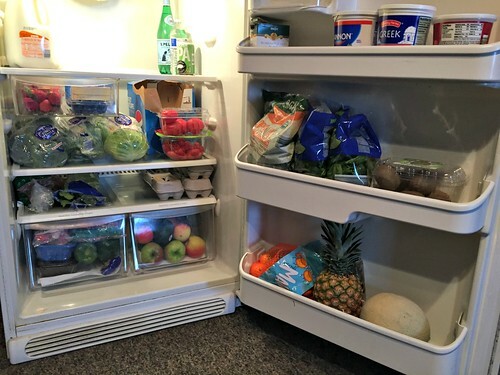 I shared a bit about this in yesterday’s post… but we are fortunate to not-only have an extra deep freezer in our basement, but also a full-size extra refrigerator that is PERFECT for storing our massive surplus of fresh produce, dairy, and eggs. 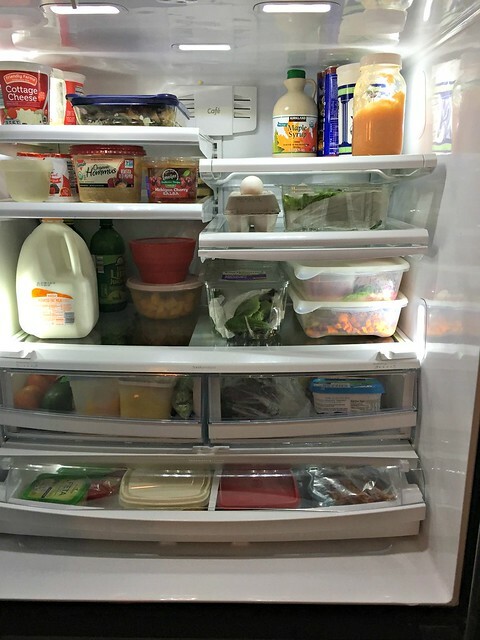 Both refrigerators are quite full when I get home from the store… see below for how I store the food inside our refrigerators. Above is a look at the entire main part of our kitchen refrigerator. 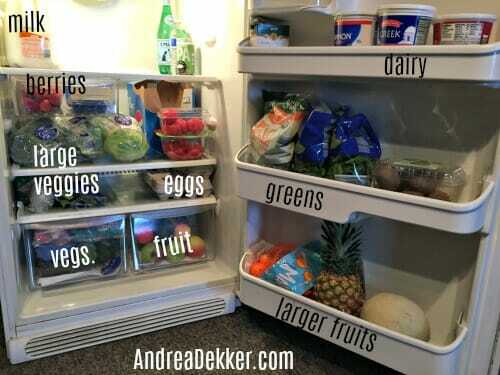 Below, I’ve highlighted how and where we store our various foods. 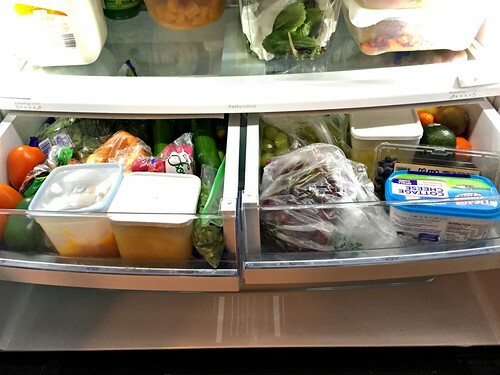 I’ll explain more about this below, but I use various food storage containers to store pre-washed, pre-sliced fruits and veggies so they are always ready for quick snacks, packing lunches, various side dishes, etc. 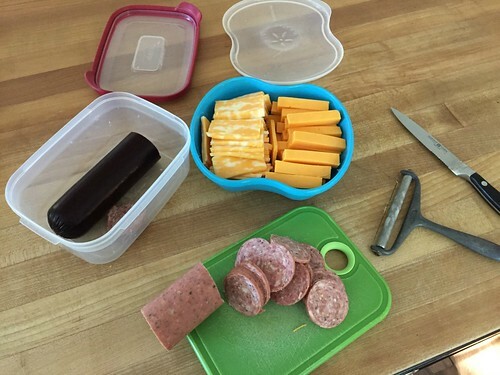 I also do this for pre-sliced meat and cheese, which is so helpful since our kids eat tons of meat and cheese! My containers aren’t fancy, cute, or matching, but they “fit” our refrigerator very well — which means I can store more food in less space! 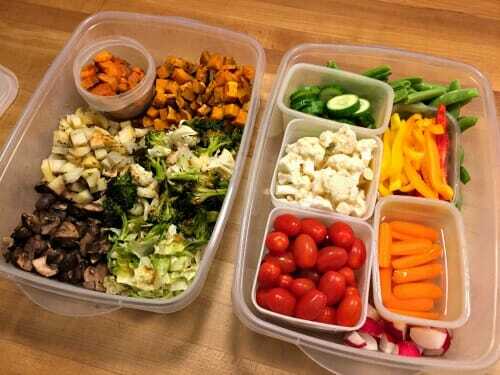 My favorite food storage containers are the large Rubbermaid “TakeAlongs” I use for my raw and roasted veggies. They stack perfectly in our fridge (see pictures above), they are light-weight, they are easy to clean, and they house a huge amount of raw and roasted veggies! 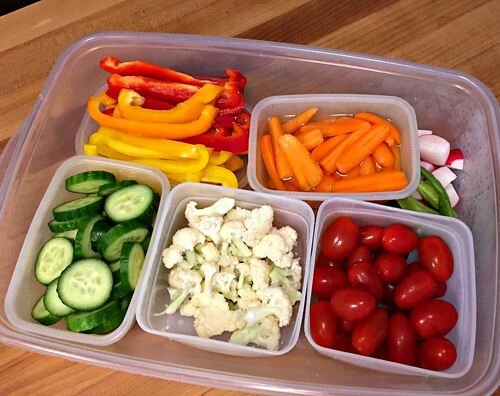 Almost any time you look in our fridge, you will find these 2 containers filled with ready-to eat veggies! This is where all the “extras” go — which is a lot as I don’t like to over-crowd the kitchen refrigerator! I often remove food from bulk packaging so it takes up less space. I also save extra 1-dozen egg cartons and divide up the huge Costco packs into 1-dozen containers for ease of storage and use. We pull items from the extra fridge on an as-needed basis in order to re-stock our kitchen fridge… and I do a mini “grocery shop” of our extra fridge roughly every 2 days so I don’t forget what’s inside!! As I mentioned in yesterday’s post, we have cold storage in our basement — great for potatoes, sweet potatoes, onions, squash, etc. I keep large cardboard diaper boxes with a different veggie in each one. 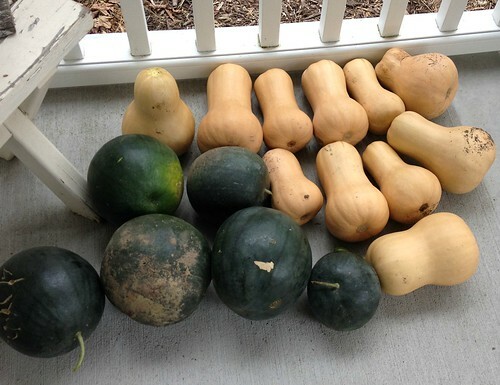 That seems to be working well for us for now (especially when our garden pumps out an insane number of squash). I love that this doesn’t require additional fridge space! And we always have a big bowl of read-to-eat (or ripening) fruits and veggies on the counter. This is probably the most time-consuming part of using fresh produce, but it’s something I’m willing and able to spend time on at this point in my life. 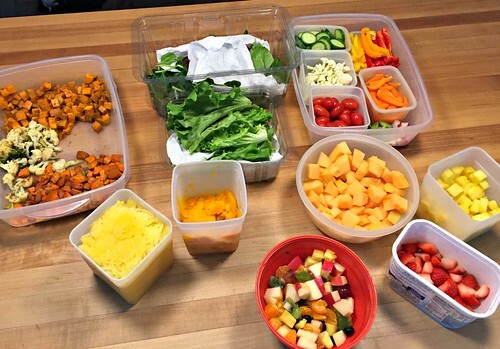 Almost every morning, I do SOME type of fruit/vegetable/greens prep-work — it’s something different every day. I do most of this while the kids are finishing up breakfast, or during my early morning child-free hours! Obviously, my main goal of buying, storing, and prepping huge amounts of fresh produce is so my family will eventually EAT IT! This means I make a point to serve a variety of fresh produce options at EVERY SINGLE MEAL to assure we all get variety and everyone likes at least a few options. I certainly can’t list every way I serve produce… but here’s a general idea of how we eat all these yummy fruits and veggies each week! 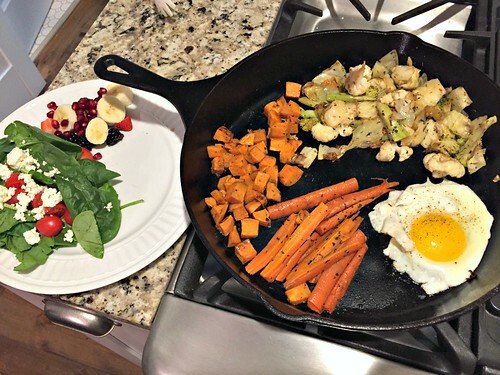 We eat fruit every day for breakfast… we also eat veggies for breakfast daily as well! 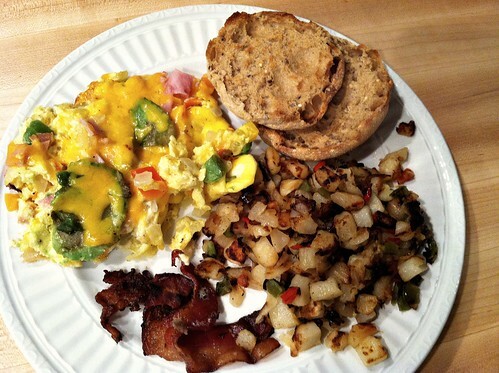 Here’s a post I recently wrote with more details on how exactly we eat veggies for breakfast. 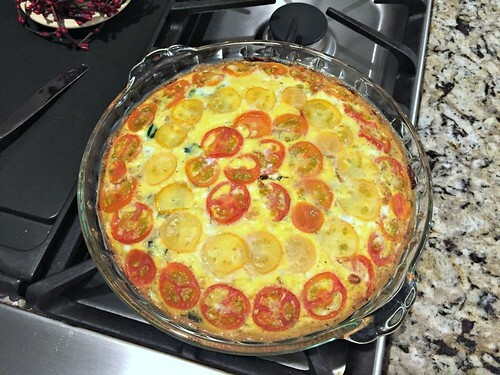 Quiche, omelettes, and egg casseroles with onions, pepper, potatoes, zucchini, mushrooms, etc. 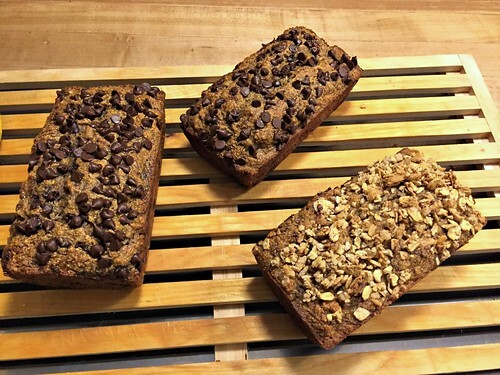 Zucchini or banana bread — not as healthy as some options, but still a way to get more fruits and veggies in! Smoothies with spinach, kale, sweet potatoes, squash, and any other veggies I can “hide” in with the fruit! 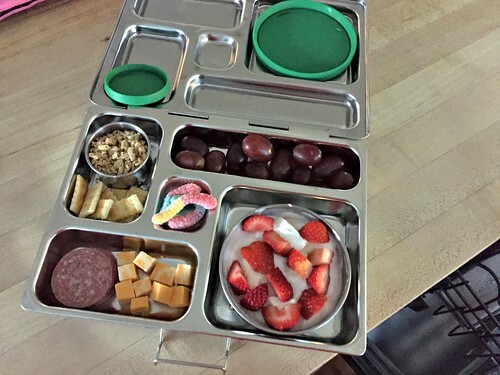 I usually let my kids have any raw fruits and veggies they want ANY time of the day — the only exception would be immediately before a meal. 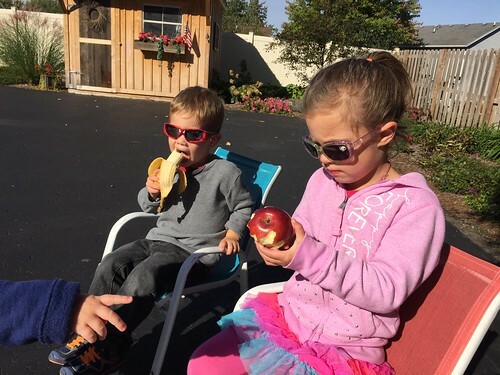 I figure if they are hungry enough to eat raw fruits and veggies, I’m willing to feed them — so we eat LOTS of raw fruits and veggies during snack time. I kept track the other day, and we went through 10 clementines, 8 bananas, 5 apples, a big bowl of grapes, 2 cucumbers, 2 peppers, a bunch of pea pods, a bowl of cherry tomatoes, and a handful of baby carrots — JUST for snacks in ONE day! 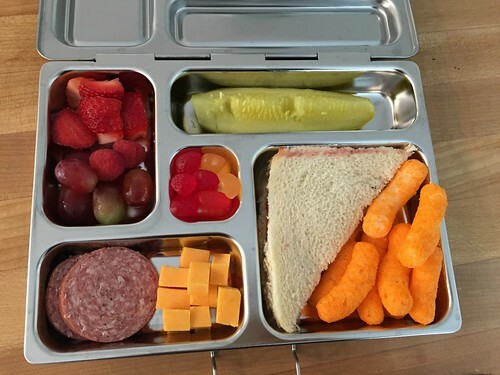 Lunch is by-far the easiest time of day for me to incorporate lots of fresh produce… I literally just plop the big tub of raw veggies on the table and let the kids eat whatever they want. 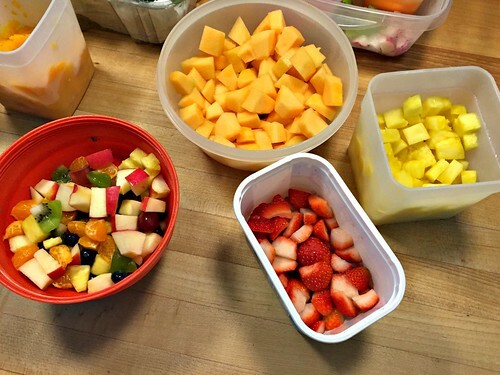 I also set out whatever containers of fruit I have already washed and cut-up — it’s SO fast and easy. We pair this fresh produce with sandwiches, meat and cheese, grilled cheese, or leftovers, depending on everyone’s preferences. Dave takes a banana and a large bag of raw veggies in his lunch every day. Nora takes a clementine orange, grapes, pickles, and carrots in her lunch every day. 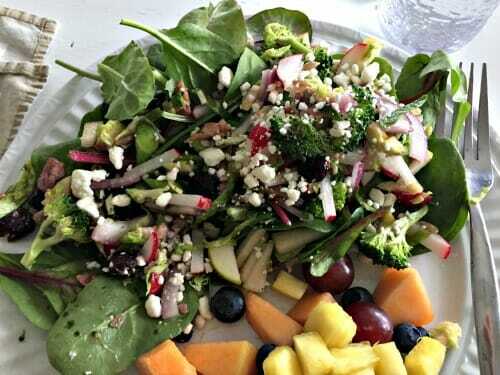 I eat some type of “big salad” almost every day for lunch — usually loaded with raw veggies, fruits, nuts, seeds, etc. and often with some leftovers from dinner the night before. 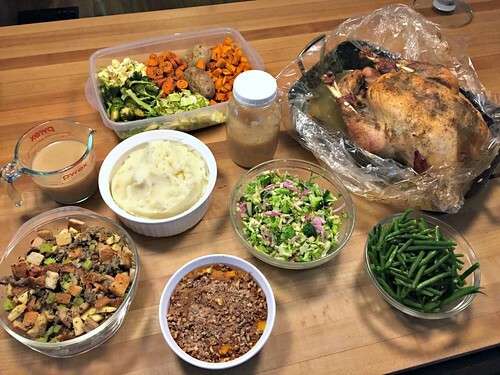 I’ve been known to get a little carried away with side dishes for dinner — but it’s fairly easy to do since we have SO many prepared foods in our fridge, ready and waiting to be eaten! 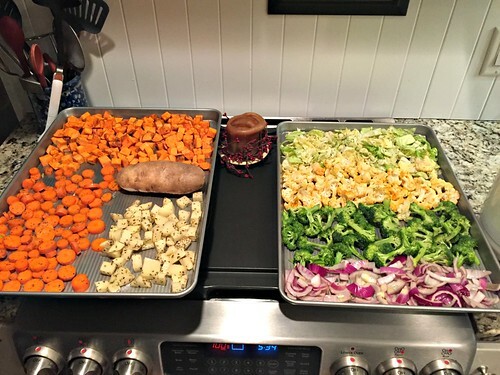 I do usually plan our dinner side dishes ahead of time — mainly so we don’t resort to eating the same things over and over, and so we make sure to use up the produce we have before it goes bad. 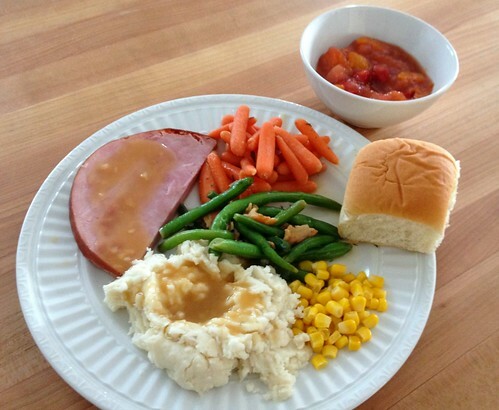 Here’s a post I wrote regarding exactly how I plan our side dishes. There are so many different ways to incorporate more fruits and veggies into family dinners, the trick is to plan your menu (and side dishes) around the produce you should use up first, so it doesn’t go to waste. As with anything “new”, it can feel overwhelming at first, but it gets SO much easier with a bit of practice. I’ve been working massive amounts of produce into our meals for a couple years now, and I find myself doing it without even thinking twice now. Feel free to ask any questions you have in the comments and I’ll do my best to answer and/or clarify. And if you haven’t read my previous post about grocery shopping every 2-3 weeks, you can do so right here (that might help clarify some of the things I talk about in today’s post). 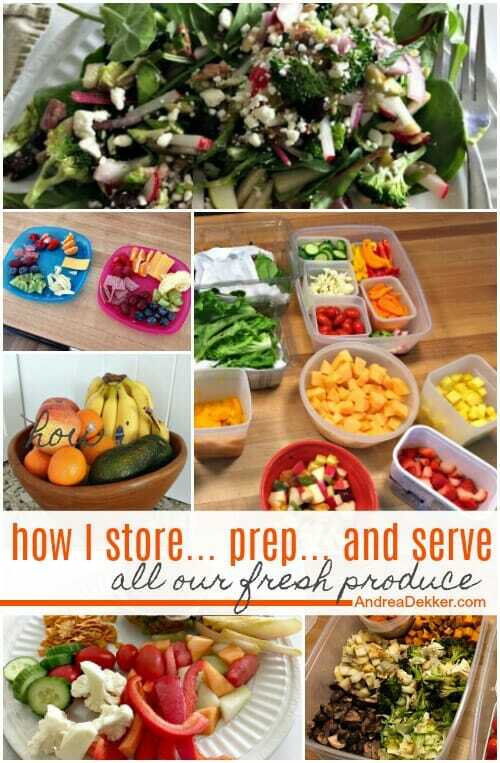 Also, I’d love to know if you have any great tips for storing, prepping, or serving fresh produce! My Favorite Mexican "Base Mixture"
Seriously, I wish you could come to my house and prep all of my vegetables and fruits. I have already incorporated the idea to cut my veggies and store them in smaller containers inside a bigger one for ease of use. It is so effective. Now if I could just make the time for prepping fruits and veggies more often. You are truly an inspiration. I love reading your posts. Thank you for all of the great ideas, and so many ideas from comments of other readers too! I appreciate all the work you do with your blog! haha — but then I wouldn’t have time to do my own fruits and veggies!! Thanks so much for your kind words — I’m thrilled some of my ideas have been helpful for you! so you’re talking about iceberg lettuce heads? right? this is exactly what my parents do with their lettuce too! Also, I’m honestly SHOCKED you can put a freezer bag in the microwave for 1o minutes! I’ve done corn in the microwave, but it’s still in the husk not in a bag (it just slips out of the husk and is really tasty). Now I’m intrigued to try a freezer bag! 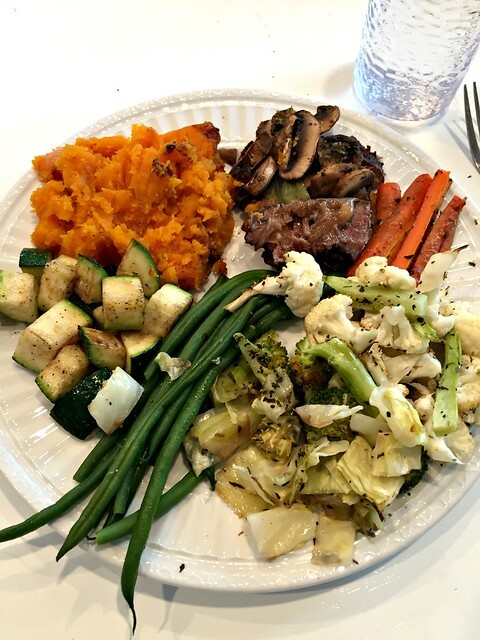 I am inspired to eat more vegetables after this post! 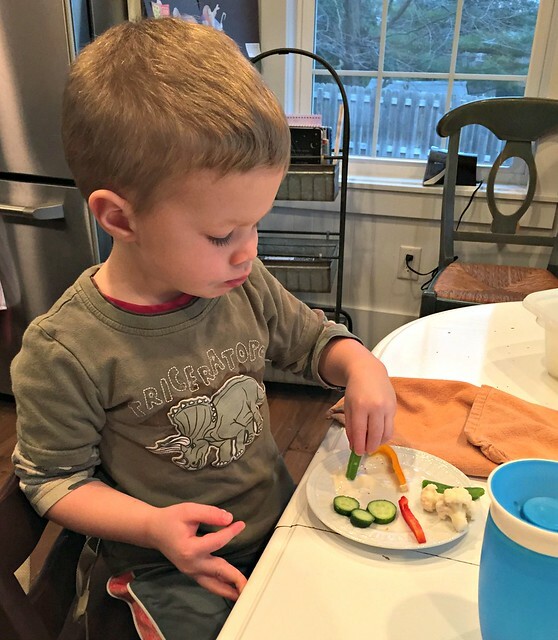 My kids love fruit but we all have a harder time with veggies. 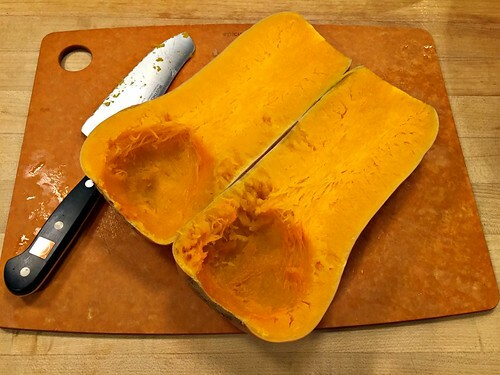 I love how thorough this post is, too, thanks for showing us these amazing tricks of less grocery shopping, smarter food storage, and actual ways to use it all up! I always feel so bad throwing produce away. 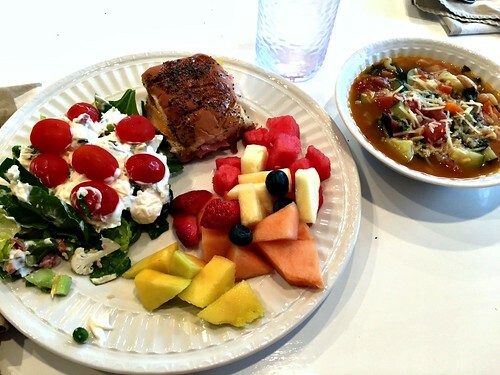 Do you have a post on how you meal plan? Love this idea! Do you think your secret to not having your fresh produce go bad is that you store it in one place in your fridge and check it each day? I know I have strawberries I cleaned a few days ago and if I don’t see them, I forget to eat them! I’m frustrated with myself over this topic every week! I’m sure that doesn’t hurt anything! I’m pulling the fruit and veggie trays out 3+ times every day, so I’m constantly looking at it and we’re constantly eating through it. With 6 of us, a package of strawberries doesn’t even have a chance to go bad because it’s gone in 24-36 hours! Do you put anything like lemon juice on your fruit salad (especially apples)? 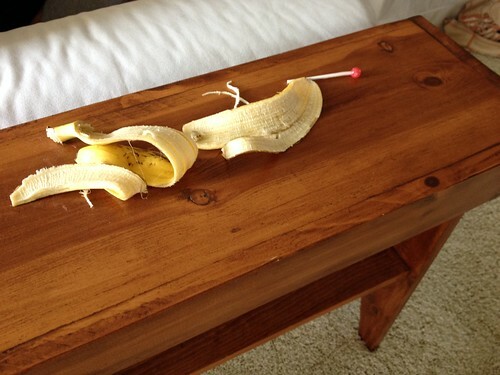 I love the idea of making a fruit salad but am not sure how to keep the apples fresh. We have been eating tons of apples lately. Love this post! It’s given me so many ideas to start incorporating! nope, nothing at all. I’ve found that as long as I do not include bananas or juicy melons, all the rest of the fruit stays fresh for 24-48 hours. We usually eat it all within the day I make it, but occasionally there is some left for the next morning, and we will eat it with no issues. I think the juices from the oranges might help to coat the apples too. I love reading your blog. Always such wonderful advice. Thanks, Andrea. It’s nice to have an extra fridge. I’ve been roasting vegetables consistently now and eating raw veggies for my snacks with cheese or hummus at work. The one thing I still have to work on is doing salads. yes, the extra fridge is FANTASTIC! I’d have to buy groceries every 3 days if we didn’t have extra cold storage! Happy salad eating! 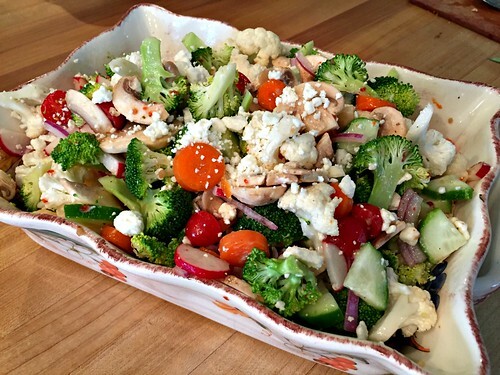 I’ve found I like salads SOOOOOO MUCH when I put “out of the ordinary” toppings on mine — like hot roasted veggies and feta on a bed of spinach, or a mixed fruit salad with sunflower seeds, and nuts on mixed greens. 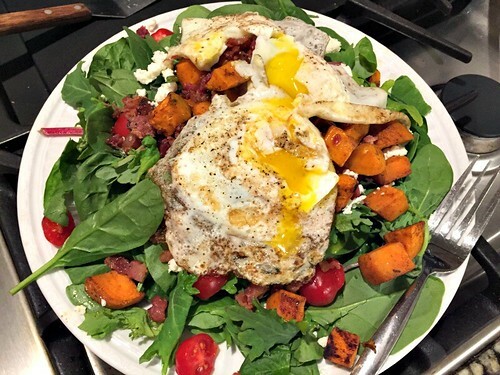 Even fried eggs, bacon, and fried potatoes on kale — it’s so yummy and I’m still getting all the vitamins and nutrients of those leafy greens! 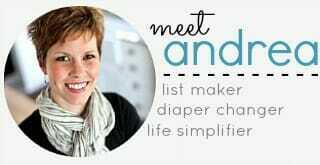 You are amazingly well organized, Andrea! Your kids certainly have a good start on good eating habits that will serve them well all their lives. I always enjoy your posts; wish I had seen your site before I did…have been checking it out almost daily since Nora was born. 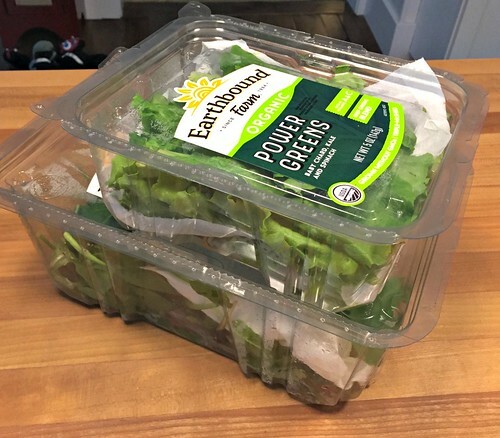 My best tip–for singles or smaller families–is to put salad greens into whatever-your-serving-size containers are as soon as you open the original packaging. I use half-pint jars of greens as the base for my jar salads every day. I started portioning them out just as a convenience and for portion control, but found that they will stay fresh for 8 or 9 days after purchase if they are separated. I use canning jar lids and rings so they’re airtight. I used to scoop the greens out of a large container, but often had to compost the bottom layer. I don’t know if it’s the minimal handling, or not introducing micro amounts of bacteria, or the air change, but it’s working very well. Worth noting is the fact that the greens are very fresh–the farmers’ market vendor I buy from has cold frames and greenhouses, so they were picked and washed the day before I buy them. 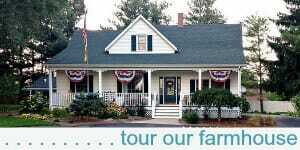 I have visited her farm–she’s a personal friend–so I trust her washing methods and don’t rewash. The greens are very dry in the package, which also extends their life. This is a fantastic tip — thanks for sharing Margaret! You have worked hard to get a ton of nutrition into your family. No picky eaters here. 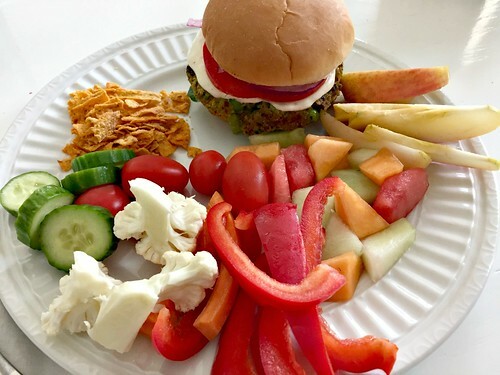 I am trying to get more vegetables into my diet and all your posts on this topic are very motivating!!! oh good — glad to be motivating!! haha — check Craigslist or Facebook Marketplace. We found our extra fridge for $150 and it’s going strong 7 years later! This post, and your previous one, is so helpful and encouraging. My family is always striving to eat healthy, unprocessed food. 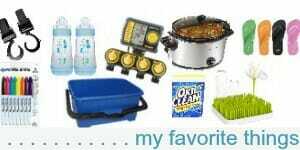 Although, I love to organize and clean, meal prep (shopping, stocking, cutting up, cooking, clean up, etc.) is more challenging for me (large family-different needs). Maybe because I don’t love cooking as much as organizing/cleaning. 🙂 It’s a daily goal though! Can u tell me about how many hours per day you spend on food (start to finish)-if its not too much trouble.Thanks! I always appreciate your practical way of doing things. If I had to give a time estimate, I’d guess I spend roughly 60-90 minutes every morning doing various food prep. This includes making breakfast, packing lunches, prepping dinner, cutting veggies, and cleaning up. Then I spend another 30 – 60 minutes putting dinner in the oven (or on the stove) and other last-minute preparations to get dinner on the table. So, it does take up a fair amount of time in my day. If you aren’t at a point where you want to spend that much time in the kitchen, I’d suggest focusing on just one meal a day — maybe dinner — and trying to integrate a few more fruits and veggies into that meal. Just a thought! I read your posts everyday. Always great! But today I must say, Well Done, Andrea. You are a master! Great post! I do things similar but I’m going to have re read this post as it contains a wealth of information. Two aha moments I had reading through was that you keep your raw carrots in a separate container with water. I haven’t been doing that and I get frustrated at how fast they dry out. 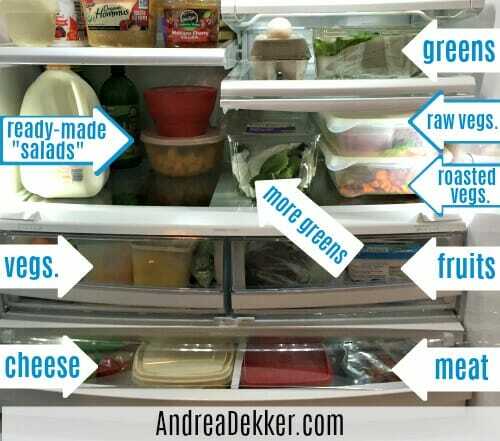 The second thing is that you pack your extra fridge and then keep a couple days worth of food in the main fridge. I’ve basically been doing the opposite – packing out my maid fridge and using the extra just for overflow. I can see how your method makes life a lot easier! I also pull out the raw veggies for most meals and snack times. It’s amazing to me how much people will snack on raw veggies if they are right in front of them but would never pull them out of the fridge themselves! And the water really does keep the carrots fresher! Dave eats tons of veggies in his lunch IF they are all cut up and ready for him — otherwise he’d never bother — so you’re right about that too! 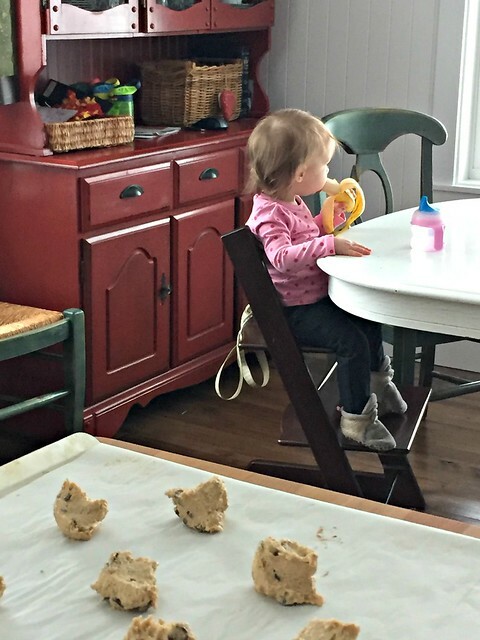 haha — glad you noticed the chip crumbs 🙂 we don’t eat all that many chips, but we do save the crumbs for little bits for our kids, or for the tops of casseroles (I put them in the freezer). I just HATE wasting food! well good for you for not wasting that cranberry! I bet it added a nice sweetness to his smoothie too! 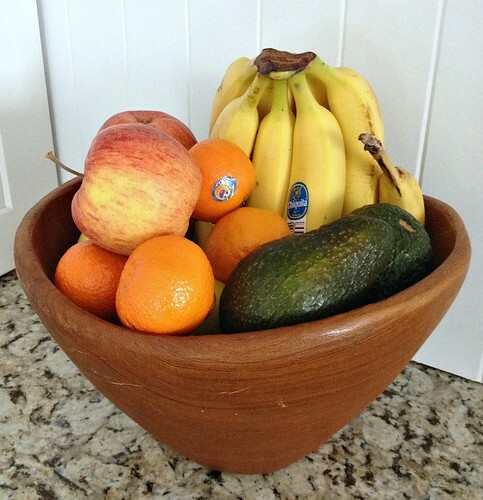 Use “green bags” to store fruit and veggies in. They work especially well for mushrooms and strawberries. i also use brown paper bags for mushrooms — that works really well! Great post! 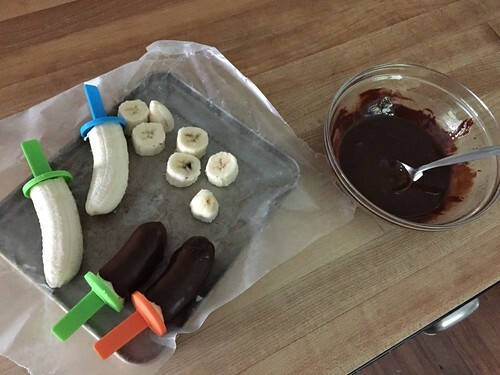 I think it’s great that you have your kids eating healthy right along with you. 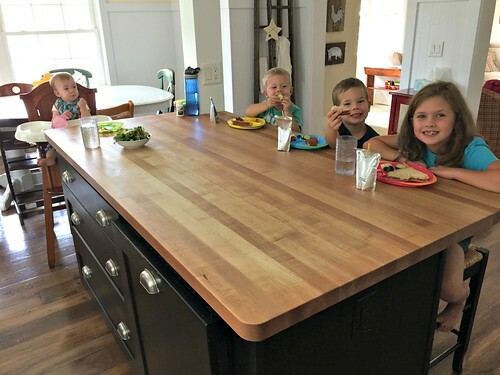 So many people (myself included) will start a new diet themselves, but think their kids still need to eat the “old way.” We do a CSA during the summer and last summer it gave us Kale/collard greens every week. The kids balked at the greens first but after a few weeks they started eating them and now they request them during the winter when we don’t eat them as often. My 11 year old son thinks any green leaf is kale and eats it, my 8 year old thinks lettuce is cabbage, but still eats both. Now we just have to get their dad to eat some too! 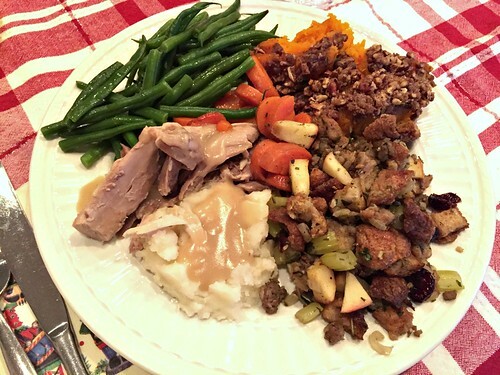 I also noticed that your plates are packed with food (or you have tiny plates)! When you’re eating very healthy sides, you get to eat so much more! I like how you’re just adding 1 or 2 new healthy things a year. Great job! One thing I want to mention is that this is NOT a “diet” for me. I do not cut out any foods (like sweets or carbs) but rather have simply tried to incorporate as much fresh produce as I can into our meals. Wow! I got so many useful ideas & tips from not only this post — but all your posts on a daily basis. thanks so much!! Glad my ideas have been helpful for you! Do you ever have trouble with your sliced peppers or cucumbers getting slimy? Or maybe you are eating them before there’s a chance for that to happen. I’ve found that when certain sliced veggies are in my fridge longer than 2 days, they are slimy and unappetizing. Not sure if I’m storing them incorrectly or if we just don’t eat them fast enough. yes, those are the 2 that would get slimy! I think keeping them in separate containers helps, but we also eat them VERY quickly. I usually cut up one or two day’s worth at a time. If they get slimyish, I put them in the freezer and use it for quiche, soup, etc. Ok, that makes sense. I think for some reason I always read these types of posts and assume people are prepping their veggies for the entire week, and then I wonder how they get things to last that long. I’ll have to try separating mine and just know that I’ll be chopping them every 1-2 days. This post was super helpful! Yeah, I think I mentioned in the post that I cut raw veggies every 2 days — not for the whole week! Megan, I do actually cut my veggies up for a week at a time. We eat most of the more perishable veggies within five days (peppers and cucumbers included). However, mine don’t tend to get slimy. The only thing I can attribute that to it that I put pieces of papers towels in the containers to soak up the moisture. And I dry them pretty well after washing them. Maybe try that? Ashley, This is EXACTLY what I do with our lettuce, spinach, and other greens — I put paper towel in with it to keep it fresher. We eat the veggies quick enough that I don’t need to do that, but I do try to “dry” them well before putting them in the container! I do put paper towels in with my washed lettuce but it never occurred to me to put it in with other veggies. Thanks for the idea! Actually, I have a second question as well…. Do you have a lot of condiments to store? I notice I don’t see any in your two fridges. I find that I have SO many condiments (e.g., BBQ sauce, ketchup, crushed ginger, mayo, etc. ), and it takes up SO MUCH ROOM. Holly – I had to go look after reading your question. I don’t think any of the pictures show the doors of the main fridge so I’m guessing that’s where the condiments are kept. But I’m with you, I feel like I’ve always got a condiment issue. My doors are packed and it’s mostly things that I only use occasionally. so… we actually aren’t big “condiment” people. We have Ranch dressing, applesauce, pickles, ketchup, a couple types of jelly, honey mustard, and mayo — that’s about it. We keep these in the doors of the fridge. Oh, and you might not realize this, but SO MANY condiments don’t need to be refrigerated — even ketchup technically doesn’t need to be refrigerated. So you could maybe save some space there too! I’ve been following you since before the birth of Nora, and I am so grateful to have this view into how you’ve incorporated more veggies and fruit into your life. 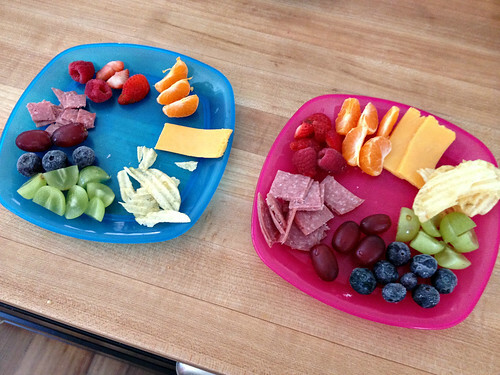 It’s super encouraging to me, as I try to increase our healthy food consumption…..especially with picky children! How much baking do you do now? I find that’s my downfall. I loooove sweets! yes, I bake all the time! Daily! I think it’s all moderation — sweet, bread, veggies! Great idea to use smaller containers within the big one!!! Often when I’m serving lunch my people are at my feet like pigeons. So I give vegetables as a “treat” before the meal, and they eat them like crazy. One day when I was peeling carrots, I had peeled the “dirty” layer off and had fresh, clean peels. They ate them like candy. Carrot “fries” or “peelies”(as my kids called them). Haha! Our Dollar Tree has a huge section of healthy snacks. While it’s not as healthy as fresh produce, they often choose the dried fruit over the other stuff. And it’s a cheap snack to grab when we are out and about. They love it!!! 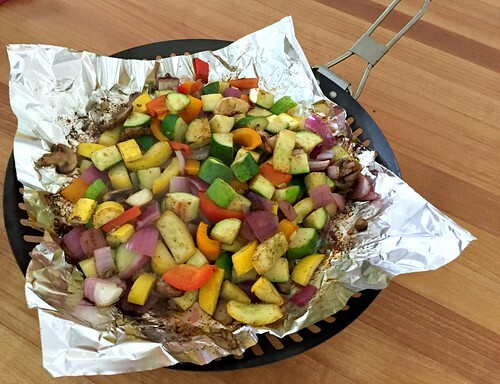 How do you reheat your roasted vegetables? If in the microwave, do you find they are soggy? That is normally why I don’t double batch my roasted veggies. Would love any tips! As for the veggies, I reheat them in my cast iron skillet. This may be a stupid question, but it looks like your sliced carrots (in your fresh veggie container) are covered in water. Is that right? Does that keep them fresher longer? not a stupid question — and yes, it IS water. our cut carrots seem to dry out quickly so i just cover them in water! Thanks, as always, Andrea! I’ve incorporated a lot of your processes over the years and they’ve worked marvelously and been easy to do. I remember a post you did a long time ago on your hand towel system. At the time I thought, “She has a system for hand towels?” But then I read the post and thought it made a lot of sense. So I began my own version of your system, and it works great! I’ve been following your posts on adding more veggies and have been using some of your kitchen tips. Using a hand mixer to shred cooked meat is pure genius! But I was looking for a post just like this, so it’s timely. Now, if you’ll excuse me, I have to go work out and cut some cucumber and wash grapes for my work snacks! Keep the great content coming!